Chancellor George Osborne has asked the Inland Revenue to check whether the 50p top rate of income tax is actually making money for the government. Some economists have claimed that tax avoidance and evasion mean the rate is raising less income than expected. Speaking on BBC Radio 4's Today programme, Mr Osborne hinted that the 50p rate remained under review. He added: "There's not much point in having taxes that are very economically inefficient." 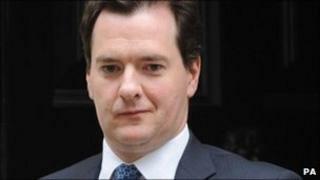 But the chancellor said the figures would not be known until at least the end of the tax year next April. The 50p rate of income tax is applied on incomes over £150,000. Mr Osborne said: "I've said with the 50p rate I don't see that as a lasting tax rate for Britain because it's very uncompetitive internationally, and people frankly can move. "What is it actually raising? It's only been in operation for a year this tax, put in place by the last government. "I've asked the Inland Revenue to assess what the revenues are actually from this 50p tax rate, whether it's raising money or not. "Since people don't send their self-assessment forms back until the end of the year we won't be able to get that assessment until the end of the year or more likely the beginning of next year, but we are going to do that assessment. The chancellor says "there is a re-basing of global assumptions about the economy" and surely we know that the prospects of growth are about to be down-graded again. The markets fear a second recession. But George Osborne believes that Britain can be seen as a safe haven. He says our banks are less likely to fail than those in France. There is no chance of raising taxes like Italy. But "hold your nerve" is a difficult message in Britain after the riots. The demand is for more government money - to bolster the police, and prevent further trouble. The chancellor knows the argument over police cuts risks losing public confidence. But he must weigh that against his determination to keep to his road map for deficit reduction, keep interest rates low, and maintain international confidence in Britain's ability to control our economy. He added: "But I would just say - because it will lead people to say 'are we making sure that better off people in our society make a contribution?' - we have increased capital gains tax, introduced for the first time in our history a permanent bank tax and I'm taking very tough action on tax avoidance." Mr Osborne also insisted that the UK was still seen as a safe harbour by international financial markets because of the way it was dealing with the deficit, and he said the government's debt reduction plan was "on track". The chancellor acknowledged a global lack of confidence about economic growth but said the UK's austerity programme had become a "rock of stability". "There has been something of a flight to safety. One of those safe harbours has been British government bonds, gilts, and it is remarkable how our interest rates have fallen to record lows, we've not seen interest rates like this since the late 19th Century," he said. "That is in part because people see in Britain the stability of a credible plan to deal with our budget deficit." Mr Osborne admitted that economic "headwinds" referred to by the governor of the Bank of England, Mervyn King, this week - as the bank cut its UK growth forecast for 2011 from 1.8% to about 1.5% - were "pretty strong". The chancellor said: "I think you've got some features of the world economy which we are now sadly familiar with, a big increase in the oil price. "But we've also had in recent weeks renewed instability in the eurozone, the spread of the concern that we've had about peripheral countries like Greece and Portugal to major European economies like Italy and Spain. "Then we've had in the United States not just the wrangling in Congress about how to deal with the budget deficit but also revision to American economic data which show that the American recovery has been far weaker than people had thought. This week we saw that the French economy's not growing at all. "So they are all challenges. I don't blame them for the situation that Britain finds itself in, because I think Britain is having to deal with serious economic mistakes of recent years. "But they are part of the context in which sadly growth in Britain is not what all of us would have hoped." Earlier this week Mr Osborne told the Commons that excessive global debt meant "the recovery will take longer and be harder than hoped". The chancellor told MPs that the world faced "the most dangerous time for the global economy since 2008".